The revival of downtown Los Angeles is continuing at a fast pace. The area is an eclectic mix of discount jewelry marts and local designer-pop-ups, along with some of the most iconic 20th century architecture. The resurgence has seen a refit of many of the old banks and famed corporate headquarters, such as the Pacific Electric building, into loft living. Once grand, dark fanciful deco cinema houses are also getting snapped up for reuse. Riding this wave and the success of their hotels in New York, Palm Springs and Seattle, the Ace Hotel team have again followed their usual instincts for interesting real estate. It has been a vision of the late Alex Calderwood, a self-styled cultural engineer, hotelier and Ace Hotel founder, who had the knack for seeing and seizing opportunities. 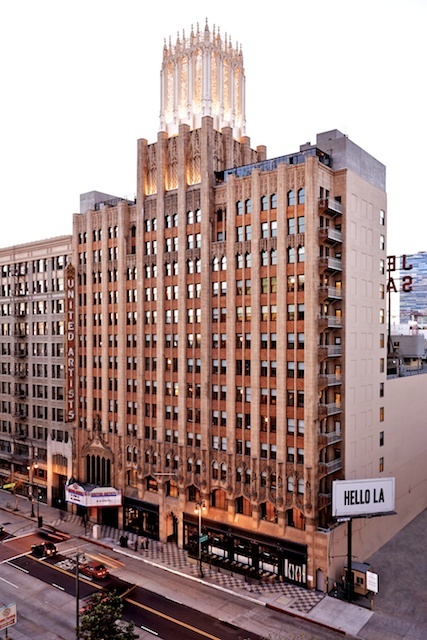 Turning the landmark United Artists Theatre in downtown L.A. into the latest Ace Hotel property, was the ultimate project before he died suddenly in late 2013. The hotel has now become a beacon of downtown L.A. style. Ace’s in-house team Ace Atelier worked with local holistic design collective Commune Design and GREC Architects from Chicago, converting the building into a hotel with 182 rooms and restoring the famed theater next door. Originally designed by noted theater architect C. Howard Crane in 1927, the theatre has been re-christened the Theatre at Ace. Actress and co-founder of United Artists Mary Pickford instructed the architects to look at the sixteenth-century late Gothic cathedral in Segovia for inspiration. On the rooftop Tower Bar one can appreciate the ornate stone spires evoking a Moorish castle that gave the building the look of a true temple of the arts. The hotel rooms feature Pendleton wool blankets, record turntables and Martin guitars, a look inspired by the practical vein of Californian high modernism of local architects Schindler and Neutra, mixed with vintage Route 66. Calderwood knew that guests who flock to Ace Hotels, want to experience what it’s like to be a part of that city’s creative culture through design and art, but also the committed staff. He left a legacy of connection and community, that is felt in the buzzy restaurants, foyers and bars, as well as in the local artisan vernacular influences and the architectural details that were so much a part of his vision.